Film lamination, archival pigment print, sintra, airbrushed acrylic, wood frame. 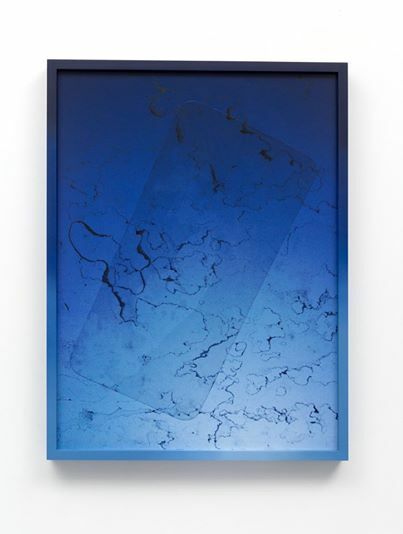 Valerie Green’s “Look Up” exhibition is currently on display from March 15 through April 26, 2014 at the Charlie James Gallery in Los Angeles’s historic Chinatown. The show consists of three bodies of work that considers our relationship with the physical world through a digital lens. In the back room a wood, vinyl, and MDF playground can be found in Green’s Pink Noise, 2013; a sophisticated Etch-A-Sketch for virtual world citizens. Pink Noise’s vibrant pink hue is alluring while the touch reaction to its tactile surface remains intoxicating. The surface marks continually morph throughout the opening reception as gallery attendees gleefully interact with the pink arena. Across the wall from Pink Noise is a series of Screen Cleaner prints. Screen Cleaner #5407, #5405, and #5415 are dye sublimation prints that perpetuate the cheerful digital play. Each 17 x 12 ¾” print plays a trick on the viewer’s eye as each appears to bow and warp with a glitch confetti that’s been sprinkled liberally across the plane. 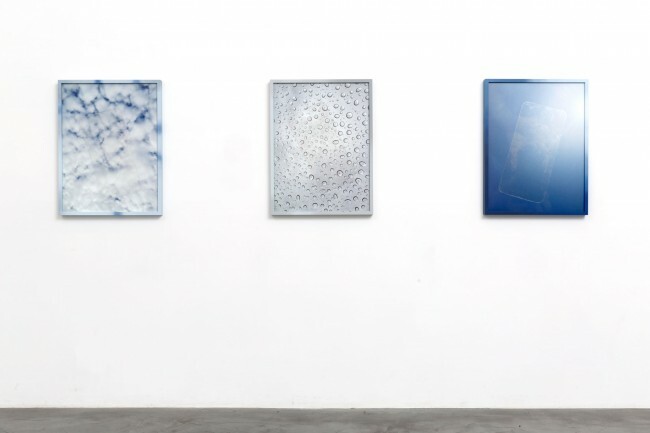 The Look Up series in the front room are bound by the existence of a smartphone screen protector amidst depictions of the sky, clouds, and raindrops. The nine unique photographic objects are archival pigment prints that have been laminated and placed inside a frame that continues the visual expanse of the image. Green airbrushed each frame to ensure that they do not constrain, as much as they continue, the photographic image. 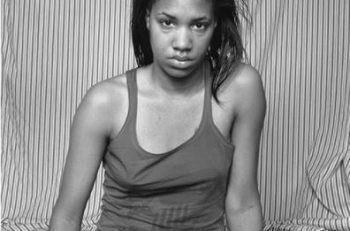 Each image was shot with her smartphone and is titled factually instead of allegorically. IMG_5597_12/17/13_11:50:42 AM, 2014 and IMG_3685_9/1/13_ 5:26:47 PM, 2014 reveals an uncanny connection to Alfred Stieglitz’s Equivalents. Stieglitz began photographing clouds in 1922 believing that they could be metaphorical equivalents of his internal feelings stating, “My cloud photographs, my Songs of the Sky, are equivalents of my life experience”. Those images then became a mile marker for modernism because they were “straight photographs”; images that were unaltered, uncropped and sharply focused, yet still purely abstract and infused with Wassily Kandinsky’s ideas about shapes, lines, and colors ability to ‘reflect the soul’. Stieglitz’s Equivalents were pictures that grounded Eastern European art theories with American pragmatism. A conversation with Green revealed that this connection was not entirely conscious, as her motivations were not to promulgate a metaphorical equivalent of her life experience, yet they still echo an experience of life not uncommon to many. In 2014, more often than not, life is witnessed through the virtual reality of our smartphones’ lens. 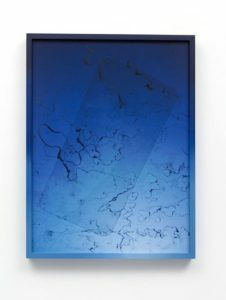 Instagram is bustling with pristine pictures of clouds in attempts to capture sublime moments, but what separates Valerie Green’s images is the deft consideration of materials as they align with concept. The frames do not constrict or close in the image, they expand from it. The prints themselves have a thin lamination protective layer. The images are of a nearly invisible screen protector where just past the invisible screen is the real world; clouds, rain, and sunshine. 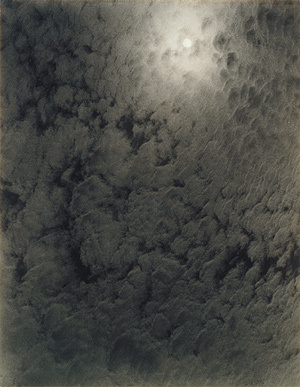 Nearly a century after Alfred Stieglitz represented the vigorous optimism of the early twentieth century with his images of clouds, Valerie Green’s twenty-first century clouds now signify the nervous apprehension of a latent threat, firewalls, the NSA, and panoptic surveillance.